Every bride-to-be wants to show off her ring. If you are a bride-to-be, you probably want to start showing off your engagement ring. An engagement ring, after all, is a symbol of love, commitment, and ultimately, a wedding. Displaying the engagement ring is the first public acknowledgement of wedding plans, and to show off your engagement ring in the best possible way, you must follow a few guidelines. First, you must never show off your engagement ring before the marriage proposal has actually been made. Whether you are window shopping with a friend or you've already purchased the ring together, prematurely displaying the ring shows off only one thing: the bad taste of the ring being more significant than the relationship. After the proposal has been made and accepted, the ring becomes a glittering announcement of your intentions. Depending on when the proposal was made, however, you may need to wait before sharing the sparkling news. For example, do not share the first engagement announcement at another special event such as a birthday party, baby shower, or wedding. By doing so, it appears that you want the attention to focus on you rather than the honored guest. It is acceptable, however, to announce your engagement and show off your ring at a traditional family gathering such as a holiday meal or annual reunion. With that timing, you are able to let many people know simultaneously without repeating your news endlessly. Before showing off your engagement ring, you must remember what it is attached to: your hand. Be sure your fingernails are neatly trimmed and filed and your hands are clean, because many people will take your hand to examine the ring more closely. If you get engaged during cold and flu season, you may want to keep a bottle of instant hand sanitizer nearby to safeguard your health and that of everyone with whom you share your exciting news. You should also be sure that the ring is at its best when first announcing your engagement. It may need to be cleaned daily while you are spreading the word to many people, and you should always keep a soft, smooth cloth available for a quick polish. A quick puff of breath on the stone's surface provides enough moisture to remove a light coating of oil or dust and can keep your ring sparkling. The first people to see your ring should be close family and friends. If you show off your engagement ring to casual acquaintances and coworkers immediately, more intimate relations may hear about your engagement secondhand. This could hurt their feelings because they weren't among the first to know. You should also consider the personal situation of the people around you: a woman who has recently undergone a bitter divorce or broken engagement may not be pleased to see your ring, or she may have a less than positive comment. Similarly, your best friend whose boyfriend is reluctant to pop the question may feel less than enthusiastic about your new jewelry. While you should not hide your news, you must realize that not every reaction will be ooo's and ahhh's. Be proud of the sparkle. When showing off your engagement ring in person, avoid thrusting your left hand under everyone's nose. Many people are protective of their personal space, and a better option is to hold your hand up with your palm facing your chest - this displays the ring but lets the other person choose to reach for your fingers if they are comfortable doing so.If you wish to be more subtle and let people notice the ring for themselves, you need to be sure that your left hand is more active than normal. Handing someone a note or other small object with your left hand is a casual gesture, but be sure the ring is pointing up where it will be easily noticed. You can also resort to making simple gestures, such as brushing your hair out of your eyes, scratching your cheek, or adjusting your glasses with your left hand. These gestures should be around your face because most people will be looking at you, rather than at your hand, and you need to bring the ring into their field of vision for them to notice. Of course, the coy smile and exaggerated motions make your intentions obvious, but it is still more subtle than a blatant cry of "look at my ring!" If you want to show off your ring across great distances, take a quality digital picture of the ring on your finger. Always preview the image before attaching it to emails, however, and crop out unnecessary space and sharpen the picture so they can see the ring's true detail. Do not, even as a last resort, substitute a generic picture (perhaps from a jeweler's website), because that emphasizes the ring rather than the fact that it is on your finger, announcing your engagement. 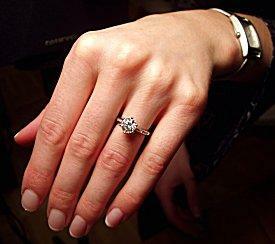 For many women, showing off the engagement ring is the first official announcement of the impending marriage. By taking care to showcase the ring in its best light and showing it to the right people in a sensitive way, you insure that their reactions will be as pleased as when you first saw the ring yourself.